By Wiz Khalifa. Arranged by Bryan Kujawa. Individual Part. 4 pages. Published by Bryan Kujawa (H0.136441-266113). 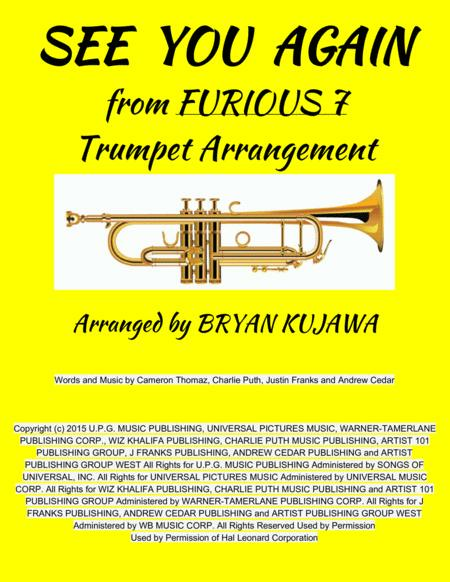 This is a trumpet solo arrangement from the film Furious 7. Watch the performance video at https://www.youtube.com/watch?v=YO8l83AYGjQ. The original key is B-flat major. This arrangement keeps that original key, putting the trumpet in C major. No sharps or flats make it very playable. This arrangement is meant to be played either as a solo or as a play-along to the original track. 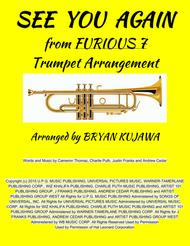 This arrangement is intended for the intermediate trumpet player due to some rhythms and range. The highest note is G above the staff, the lowest note is G below the staff. There are 3 pages of music and 1 cover page. For more information on the arranger, please visit http://bryankujawa.weebly.com. Thank you!